We wanted to a change for breakfast today so we hopped around the corner to Hot Baking Company. 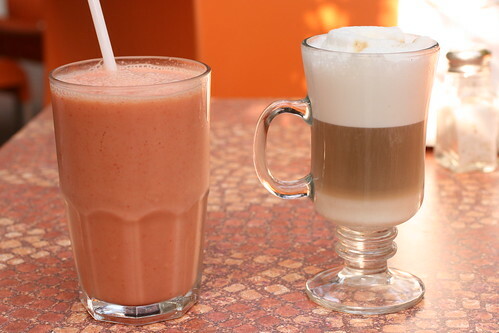 Lon started with a Orange Strawberry Mango Smoothie with Yogurt, that tasted mostly of orange juice. I had a cappuccino that was really weak. So far, all of my coffees and cappuccinos here have been surprisingly weak. Our waiter recommended omelettes and sandwiches so we got one of each. 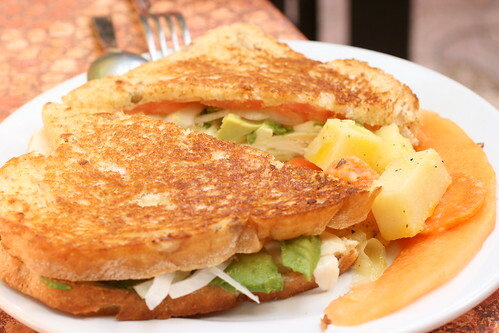 I chose a Three Cheese Sandwich, made of Panela, Oaxaca, and Gouda. The cheeses here are extremely mild. Neither of us could taste what was supposed to be Gouda. It also came with avocado (not mentioned on the menu) so I had to pick it out. Yet, the sandwich was still very enjoyable, the bread being very fresh and me just loving cheese. Neither of us liked the cold potato salad on the side. 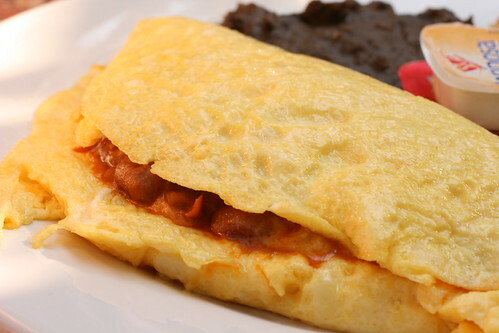 Lon chose an omelette with ground beef, red beans, and cheese. The eggs were nice and fluffy and the beef and beans were in a flavorful sauce. It came with refried black beans and the same good toast used on my sandwich. The breakfast was very filling and reasonably priced at 175 pesos (around USD $ 12.28). It’s a safe bet for some standard freshly made food. You won’t be wowed, but you will be satisfied. posted by jessica	at 02:13 PM	Filed under Breakfast or Brunch, Drinks, Fusion or Mixed, Restaurants, Travel. You can follow any responses to this entry through the RSS 2.0 feed. Both comments and pings are currently closed. Everything looks good, I’m a huge avocado fan so I like the idea of that sandwich! Excellent post. I was checking continuously this blog and I’m impressed! Extremely helpful information specially the last part 🙂 I care for such info much. I was looking for this particular info for a very long time. Thank you and best of luck.